World U20 cross-country champions Jacob Kiplimo took the honours at the 86th edition of the Cinque Mulini in San Vittore Olona, the sixth and penultimate leg of the IAAF Cross Country Permit circuit. Kiplimo won the men’s 11km race in 34:00 minutes, beating Ethiopian Telahun Bekele by 17 seconds. The men’s race saw an eight-man leading group formed by Eritrea’s Kokob Ghebru, Kenya’s Peter Ndegwa, Jacob Kiplimo, Italy’s Yemaneberhan Crippa, Ethiopian runners Taye Girma and Haile Telahun, Yassine Rachik from Italy and Filmon Ande from Eritrea which went through the second lap in 9:17. The leading pack was whittled down to six men when Bekele, Ndegwa, Kiplimo, Ghebru, Girma and Crippa pushed the pace, going through the third lap in 17:44. Kiplimo and Bekele increased their pace, pulling away from a chasing three-man group formed by Ndegwa, Crippa and Girma and opened up a gap of 16 seconds during the fourth lap. Kiplimo broke away from Bekele during the last lap, dropping him by 17 seconds and went on to win in 34:00. Taye Girma prevailed in the battle for third place in 34:31 edging Ndegwa (34:34) and Crippa (34:36). Kiplimo became the first Ugandan to win the Cinque Mulini race since Boniface Kiprop’s triumph in 2004. “I am very happy with the win in this prestigious race,” said a cheerful Kiplimo after the race. “It was not a difficult race today. “My goal for the season is to run under 27 minutes in the 10,000m and win a medal at the Commonwealth Games in Gold Coast. 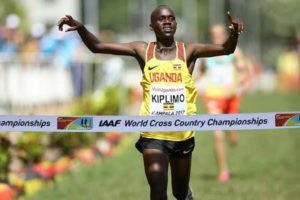 Only last year, Kiplimo become Uganda’s first ever gold medal winner at the World cross country chamiponships when he won the Junior Men’s event in Kampala. 10 Lorenzo Dini (ITA) 35:37.